Dressing in one colour or similar shades from top to toe is very slimming as a column of colour elongates the frame giving a leaner silhouette. And the good news is that you don’t have to stick to black. Black may be slimming, but so are navy and charcoal and chocolate brown. In fact any deep colour will work, so choose your most flattering shade. Another way of achieving a column of colour is to wear the same shade in your top and bottoms and then add a contrasting or tonal jacket over the top. So for example, a column of navy blue with a stunning yellow blazer. The dark silhouette underneath serves to elongate your frame and the bright coloured jacket adds interest and personality. Again choose your best shades. If you have soft colouring with little natural contrast, you may find wearing a more tonal combination such as a jade jacket with a navy column more flattering. Brighter colours can be very striking particularly in the warmer months. Take a leaf out of HRH’s book. We rarely see her in black (state occasions and funerals only). Generally she favours columns of vibrant colour. 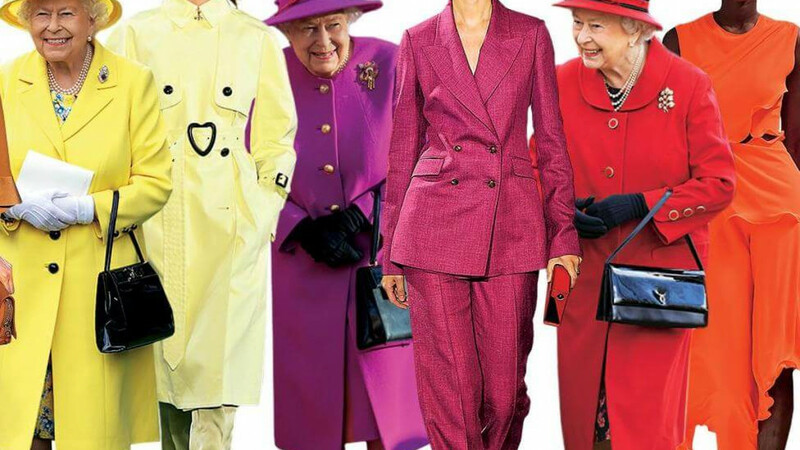 There are lots of brightly coloured trouser suits around this season, a perfect choice for a formal occasion such as a wedding particularly if you don’t enjoy wearing dresses. And they’re versatile too because each piece can be worn separately to create different outfits. If you feel they’re a bit too business-y though, how about a jumpsuit? Bright colours look particularly good on people with vibrant colouring and also work well with a sun tan. As well as tutti-frutti bright colours, all shades of beige are very much on-trend this season. Taupes and caramels tone beautifully with soft whites and creams to create a stylish sophisticated look which is particularly flattering for those with Soft colouring. Choose good quality fabrics that aren’t see-through though and wear flesh coloured (not white) underwear to be on the safe side. You can always inject a pop of colour and/or pattern with your handbag. A leopard print bag, for example, would be a nice finishing touch for the outfit below. Light colours can add pounds to your frame though so pay attention to the cut of what you wear. A longline jacket such as the one pictured above can be wonderfully streamlining and is very on-trend for this season. As well as using colour to make you look taller and slimmer, you can use it to balance out your figure. So, if you’re heavy on the bottom half, stick to darker colours below the waistline and wear your lighter brighter colours on your top half, and vice versa. A great way of making your legs look longer is to wear the same colour shoes as your trousers. It gives a continuous unbroken line from top to toe and an instant limb extension. However if you prefer to wear a slightly cropped trouser or indeed a skirt or dress, wear shoes that are close to your skin tone. Go for a pointed shoe and avoid ankle straps which can tend to make legs look shorter and stockier. Look out for next month’s blog Style Me Slimmer when I’ll share more tips on how to look slimmer and more shapely. This entry was posted in Blog and tagged best colours, clothes, colour contrast, summer style. Bookmark the permalink.